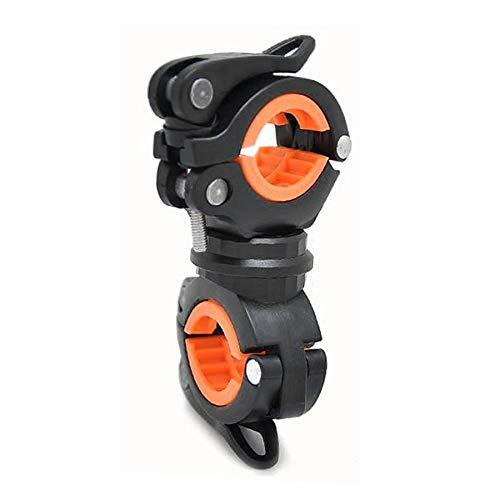 Designed to clamp and hold LED flashlight torch on your bicycle firmly, keep it steady and strong. Can rotate 360 degrees, up and down can be quick-release separation. Easy to mount on your bicycle with a screw. Multifunctional, can used to fix flashlight, inflator or other personal effects. Suitable for holding most LED flashlights with the body diameter from 18mm to 38mm. Superior rubber can adjust the clip size and protect flashlight and bicycle from scratches. Cycling conveniently and safely at night, light the way back home for you. Great for camping, hiking, hunting, outdoor activities, travel, emergency & survival kits, etc.